Last summer my brother brought home some favours from a small wedding in which the bride's labradoodle was the ring bearer. The favours were puppies made from wash cloths, which my mom wanted to replicate to give as favours for her retirement dinner earlier this month. These would be great for baby showers - they're cute and useful! If you don't want it in the way, just take it apart and use it as a dish rag or whatever! They're so cute but when you look at them for too long, it's like when you keep looking at a word and it starts to look wrong - after staring at the puppies for a while, they stop looking like puppies! 1. Take a wash cloth and start rolling one edge until you get to the middle. Roll it tightly since it will loosen a bit as you go along! (Optional) My mom used pins to mark where the middle was. When I was making them, I just eyeballed the middle. 2. Use 3 pins to secure the rolls when you get to the middle, but be careful as my mom said that in later steps she kept poking herself. 3. Roll the otherside towards the middle. I didn't use pins and kept flattening the first roll down while I rolled the other side and then just tightened both rolls before the next step. 4. When the wash cloth is rolled up on both sides, pick it up and fold one third of it over so that the rolls are on the outside. Then fold the last third on top of that. 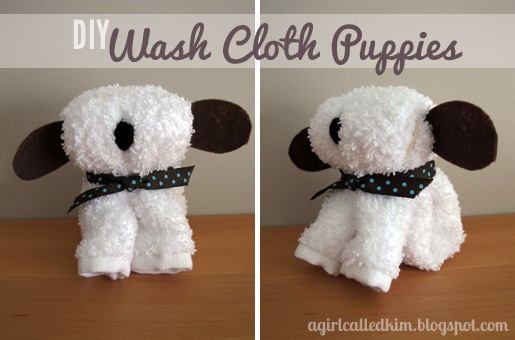 For more emphasis on the nose and a smaller dog, fold the inside layer so that it's a little longer than one third of the length of the wash cloth, and then fold the top layer so that about 1/2" of the inside edge is folded over as well. Here you can see the inside layer is flat so even with the elastic, the head is pretty flat. Two photos down you can see that we folded the inside edge a bit to give the head some pouf. Here you can see that the rubber band was wrapped horizontally and then vertically, which is supposed to simulate the nose/eye area... Our wash cloths were a little too thick but you can see it in the brown dog at the end of this post. 6. (I would actually recommend doing this step last since the pom poms might fall out while putting the ears in or tying the ribbon). Spread the gap between the rolls a bit to squeeze a pom pom in. We used 1/2" pom poms, I think. 7. From the sheets of felt, cut ears with long ends that will stay between the towel well. 8. Using a chopstick or some other thin stick, push the end of the ear in between the back two folds and repeat on the other side. Fix ears to your desired length and position! 9. Tie a ribbon over the elastic and you're done! The brown one is the one from the wedding. I thought the elastic sticking out above the ribbon was supposed to be its collar, but my mom and aunt said it's probably the tongue, so that's another optional thing you can do if your elastic is long enough (ours weren't). 10. Admire your pound of puppies! There are sites where you can purchase these puppies ready-made for about $3 each, but each of ours cost about $1. I think I'm calculating it incorrectly, but it's roughly $0.75 per puppy! We made at least 60 puppies and had just enough ribbon for those. Here's my little guy (only temporarily). We put a puppy at every place setting since the name cards kept rotating, but we gave ours to the coworkers at our table who have more than one kid so that there'd be no fighting! Cute, no? I'm a little tired of them though. We're actually still making some for those who couldn't make it to the dinner. 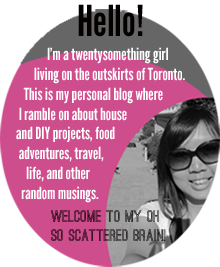 in fact loved account your weblog posts. Anyway I'll be subscribing to your augment or even I success you access consistently fast. show it's really a winning formular. maze and intersect with ravines and caves. The most recent version of Minecraft involves seventeen diverse varieties of creatures. network, then it is completely locked. I visited many sites but the audio quality for audio songs present at this web page is really wonderful. to get to the Cheap Oakley Sunglasses Cheap Ray Ban Sunglasses Ray Ban Sunglasses Oakley Sunglasses Cheap Oakley Sunglasses Cheap Oakley Sunglasses Oakley Sunglasses old age. that, that iss fantastic blog. A great read. I'll definitely bee back. Homemade Mayo...because I was too lazy to go to the store.